2. Open the drip valve until the lighter cup is 1/4 full of fuel. 3. Ignite the fuel in the lighter cup and return the cup into the flue. In approximately 1 minute, the flue will be preheated. 5. Open the drip valve and the stream of fuel will ignite from the burning lighter cup. 6. Swing the lighter cup back into the flue and adjust the flow of fuel to just below smoke point. When the flow of fuel is excessive, an explosion may result. If dark smoke is coming out of the flue pipe, reduce the fuel flow. 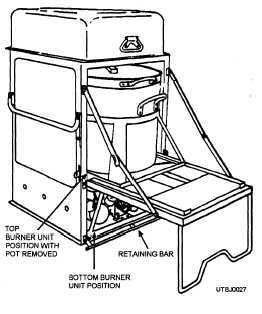 The portable field range used by the NCF has a self- contained burner unit that is portable. The burner unit can be used with a range unit or by itself. Figure 2-8 shows the M59 range unit and M2 burner unit. When the M-59 range outfit is used for cooking or baking, the M-2 burner should be placed in the bottom position. When the cabinet is used for frying, the burner should be placed in the top position. The two burner positions are shown in figure 2-9. Figure 2-9. - Burner unit positions. Figure 2-8. - M59 range outfit with M-2 burner.